Coll. No. 1233, 20 Jul 2015, characters observed: Biennial/Perennial herb, to 50 cm. ; Leaves, cauline, alternate, 30 mm. × 12 mm. 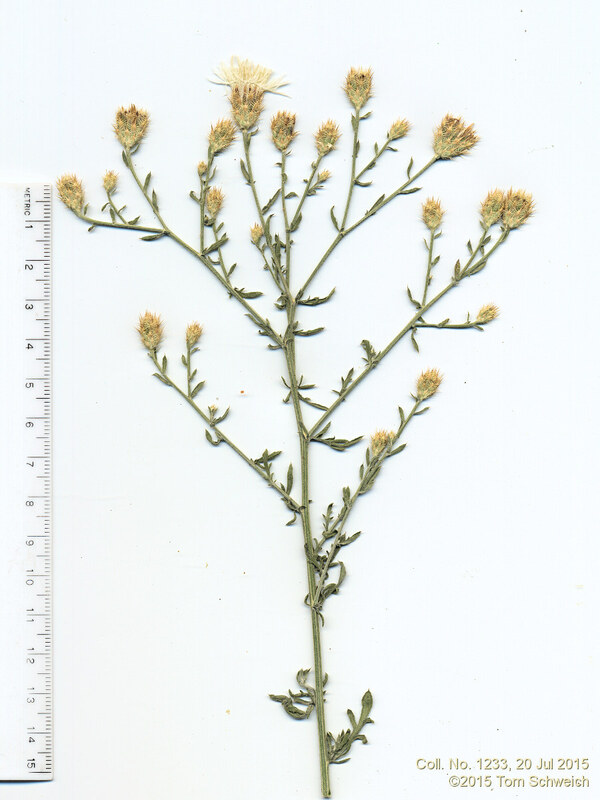 wide, pinnately lobed, much reduced and entire above, spine-tipped, margins not spiny; Inflorescence, heads borne singly, flowers of one kind; Involucre, 10 mm. ; Phyllaries, 4+ series, graduated, 3.5-10.0 mm., all spine tipped, outer and middle with marginal fringe spines; Receptacle, flat, epaleate, bristly; Disk flowers, inner bisexual, Corolla, tube 7.5 mm. + lobes 3 mm., white; Pappus, 0, or very thin ring of scales. Checklist Flora of Native and Naturalized Vascular Plants of Golden and Vicinity, Jefferson County, Colorado: Centaurea diffusa. “Tilting Mesa Cut-Off,” North Table Mountain Park, Jefferson County, Colorado: near saddle. Field Notes: Coll. No. 1233, 20 Jul 2015. Other photos about Species - Asteraceae or Centaurea diffusa.